Uh Oh...........the fiber fairies were very, very good to us today. Not only did we get a tonnage of Koigu Yarns (Shelley, your Magique kit is out of this world--I mean just smashing!). I had to peek--the boxes aren't checked in yet.....but they're packed with lovelies (I saw a stained glass Magique kit that knocked me over, too!). And there's all kinds of wonderful patterns for things I've never seen before--THANK YOU TAIU! (and thanks to Richard for the special markings on the boxes.........details later). Surprise, surprise....Rowan's here (no advanced warning...at all!) but the boxes aren't opened..........yet. Mwahahahaha. But yes, it's Rowan 1, Rob 0 (Anne is right.........so very right). Pick Up Sticks kits and patterns arrived by surprise today, including two models for their ADORABLE hats. I mean adorable. We have both kits (in the most amazing felt bags that hold the kits) and the individual patterns. The projects use......coincidentally.......Cascade 220 yarns, which is a perfect tie-in for us. Look for more goodies about them in the near future on this blog and probably Matt's. There's more more more......but it's Third Thursday and there's work to be done........and yarn to move out of the way so we can serve food. Here's how bad it is in here right now. For over a week, there's been 14 boxes of yarn in the kitchen. It's down to 11 as of last night, possibly 10. Then today's onslaught arrived. And since I won't cook in front of yarn (hell, I can't even SEE the stove from the fridge, let alone use it), we're having the affair catered............but trying to figure out where to serve from (and where to put the table) is my challenge between now and 5:30 p.m. I'm gone........go knit! And thanks for everything! Be good to yourselves and to those you love! Yes, it's not a secret. When it comes to pretty yarns (and some not-so-pretty ones), I have NO RESTRAINT. What is it this time, you might ask? It's rewarding to see so many of you have so much fun with a post, and yesterday's entry about the new Gedifra pattern collection definitely caused a bit of a stir. From discussions of the designs and fibers used, to sizing issues (many European patterns are written for a narrow target audience and slender wearer, and/or they expect the knitter to be fairly experienced and able to redesign something on their own rather than run a variety of size options), and beyond, it was fun to hear from everyone and to see entries on the tagboard, in the comments section, and over e-mail. THANKS for reading! And no, you don't have to skirt around my blog to avoid purchasing yarn--this is nothing more than an informational forum.......so let's get on with today's informative entry! Yah-huh.......right. Check out the title and then below to see who's in the sights of my blog-gun today. Four more boxes of goodies arrived today, and one of them really surprised me (yet it didn't). Guess what came today? From what I gather, the yarn knits up nicely and has fantastic drape in the fabric, despite both base fibers not having much memory to them. The styles in the book seem to be very drapey, with wraps and cardis predominating. Overall, the palette is signature Debbie Bliss--slightly subdued. I think it would be interesting to try in a different design, which shouldn't be hard given that it's aran weight (18 sts/24 rows in 10cm)--bang on Mission Falls gauge.....or Rogue.......hmmmmmmmmmmmm. Why that's more Misti International Chunky Baby Alpaca---in the brand new shades. Yup, they're colors that resist digital photography, but trust me in the fact that the left one is a LOVELY fucshia and the right is a rich pumpkin with beautiful heathering in slightly golden tones. And in the center--the brand new fawn/natural moulinette. They join the full complement of their brothers and sisters on the shelves, as we stock all shades in the chunky, sport, and lace weight and offer them at $11.16, $5.13, and $5.13 each (that's $12.40, $5.70, and $5.70 full retail). I know it's turning to spring in a week (tell that to the inch of snow on the ground here), but I couldn't resist the new Misti, now could I? And speaking of irresistable, you may remember that we placed a monster-sized order for Great Adirondack Yarns a couple weeks ago with our stellar yarn rep Pam. Well, the first phase of that arrived today as well, in the form of one fiber, Rococco. Rococco is 72 yards of a nylon/polyamid embellishment yarn that is just striking in person. It's got great shine and texture, between the metallic core and the subtle, textured lashes that emanate form that center strand. What you see in terms of colourways, from upper left around clockwise would be Autumn, Cappuccino, Midnight, and Irish Creme. At $9.90 TB ($11 retail), this is a fun way to add a little POP to a project without a huge cost. And it is SOOOOOOOOO soft (surprisingly so for a metallic). YUMMY! Now on to the other half of our program. is kinda fun and would be a good traveling project, as the squares are probably simple to knit on the road. The hoodie on the right is done in Cotton Cashmere. Sooooooooooft. They call it a "pyjama sachet" and it is lined with gingham fabric. Hmmmmmmmmmm. The dressing gown on the right is Cashmerino Aran again. I bet it's nummy---and I bet it wouldn't be so bad in the Cotton Angora, either! I really like the ticking fabric used on the backside, and the upper is knitted in Cotton Denim Aran and finishes at 25 1/2" square. They call it a floor cushion, but I like the idea of a BIG throw pillow, in cabled goodness. We have several new knitters who are intrigued by cables--this may be the PERFECT project for them! And not too big an investment at under 500 yards of aran-weight yarn (oooooooh, maybe the Cotton Angora?). And the slippers are cool, shown in Cotton DK (Hmmmm, maybe some of that Butterfly Super 10 we have would be perfect, and very affordable!). So that's the second new book. Overall, it gives me a feel of being alot like Erika Knight's "Comforts of Home", but with Bliss yarns instead of Rowan/Jaeger. I like it, and I think I'll knit a couple things out of it soon. I like the idea of knitted pillows, so those are what hooked me. For now, I'm gone........have a great Wednesday, and stay tuned, as we still need a big expose on the Plassard yarns that arrived recently, and they are outta this world. Cottons, silks, some novelty stuff, and great designs. And great Italian yarns from Gerafil. You'll see---soon! A semi-quiet day at the ranch, with only two boxes of goodies arriving today (one packed with buttons--HOORAY!! and the other with a single bag of Plymouth Encore as a special order). It's good to have buttons now, and I'm sure the special order was welcomed (she's already been in to get it). So in between the folks needing help in the shop, the mail orders we packed and got out (I filled two of those corrugated plastic tubs today as well as a STACK of boxes), and other duties, I managed to snap a few photos to share with you today. Here's a little essay on a recent pattern book from Gedifra (click on that hotlink and turn up your sound for some groovin' tunes from Germany). and I like it a lot. There's tons of fun things in it to knit, many of the yarns look to be fairly substitutable if you don't want to knit with the original fibers, and the price is right ($12 retail/$10.80 TB). The cover sweater is cool! But you'll see it later on. The left is a little too 70s/granny square for me, but the shape on the right is darned fine........or maybe it's just that action shot??!?!?! Then there's the neutrals, especially the far right, with the bell sleeves. Modern Cotton on the left (easily substitutable for a number of yarns we have at the worsted gauge) and Beauty Cotton again on the right. and check out the legs on the right. Granted, it's a sharp sweater, but sheesh! What a pair a' gams! along with another fun one in Mauritius. The one on the left uses Costa Rica, a really wide microfiber rag-type ribbon (7 sts/10cm) and Cubetto, a wicked little polyamid ribbon that we just got in under a different name/label (ours is called Gerafil Luna and comes from a mill in Italy that is just entering the US market--we received a ton of their yarns on Thursday, with our Plassard order--all of which I'll show you in the next couple days; I finished a swatch with the Luna tonight). The shell is really cool and would be perfect for the upcoming season (and the yarn, Beauty Cotton, is incredible stuff). 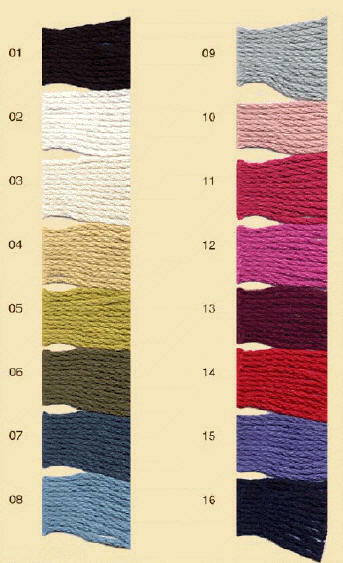 Modern Cotton is used for the cabled sweater on the right, which is an easy substitute for worsted-weight cotton (Clip, King Tut, and others come to mind). made in Modern Cotton (again, any worsted would work!). Why can I just picture Le Bonne Tricoteuse in this little number. And the right--aside from the Jamie Sommers pose--looks like a great project in..........Modern Cotton. Great color work and very fresh colors! Last, we have the model garment that we expect shortly to go with the spring/summer Gedifra line. Pretty cool stuff, no? Some of the locals have been making warmer-weather scarves with it in the mean time, and now there's pattern support to go with. All these patterns are nice, but let's see some of the yarns! On the left is Gedifra California Color. On the right we have Filati King Kelly. They're both made in Italy, they're both the same fiber composition, and they're the same gauge and the same yardage per 50g ball. So what, you might ask, is the difference??? The Gedifra California Color is $8.50 retail/$7.65 TB, while the Filati King Kelly is $5.90 retail/$5.31 TB (oh, and Kelly comes in more colors). We met California Color first, then Kelly. When I found the STRIKING SIMILARITY, I ordered Kelly and canceled the remaining California Color. Same yarn, $2.60/ball difference. Shame on the distributor for taking the additional mark up by changing the ball band.. The very bottom row that you can see are Kelly colors (and we have California Color in ones that we don't have yet in Kelly, but will soon--they're on backorder for now). Left to right they are a blue mix, a deep purple mix, tans/greens, and the neutral mix from above. We also got some great pattern support from Needful Yarns.........wanna see? These are basically Kim/California patterns. Top left--the pink number has some simple cables moving up the waist area. Top right uses two strands of Kim and a 6.5mm needle--quick work! Bottom left--that's a really fun shoulder reveal. Bottom right--a nice short-sleeved number with small eyelet across the body. These are for the multi-colored versions of the yarns, as above. Blend a solid and the multi on the left, use just a multi (with a solid welt) in the center, and all multi on the right, with a crocheted edging. Cool thing is--the patterns are as affordable as the yarns. $3.50 retail ($3.15 TB) for single-sheet patterns, and $5.50/$4.95 for multi-page patterns (I think all but one is a single-page ditty). One more item, and I'm outta here..........more Koigu is in transit folks (stalk it on UPS using this tracking number 1ZAA52581218007621--no plotting a hijack, Lana--though I hear she's off on family business......our thoughts are with you and yours, kiddo!). This 132-pound batch is lots of Kersti, a good bit of Painter's Palette/Premium Merino, and more Rumba, Loop, and patterns. Also in the batch should be the Carousel and Magique kits several of you have requested, including Shelley's green-based Magique (I adore Shelley, and her Rita Rudner quote at the top of her blog made me howl this afternoon, when I visited), my hand-picked Carousel, and a couple others for some great folks out there. We expect it in house on Thursday (just in time for Third Thursday--dinner's theme is "Springtime Fresh", and I'll be doing lighter fare like pasta salads, cool trays, and the like, despite the forecast of snow and flurries over the next three days). I'm beat--this is one hella-post. ENJOY! That's been what it's like around here lately--more fun than you can shake a stick at! With the close of the "business week" on Friday, we can officially claim to have had FIFTY TWO boxes of yarn (yes, 52) delivered in a five-day period. Do you need pictures to see how we're just overrun with new goodies and wonderful things? Well, maybe later--for now, I'm focusing on a little bit of fun that arrived early in the week. Fresh from Canada, via Toronto and Needful Yarns comes this awesome yarn, named for the city of it's origin--TORONTO. I like it, and oh my is it a quick knit. The yarn is 62% wool, 23% cotton, and the remainder man-made, so it's gonna be warm and comfy. And I made mine on US 17 needles and only eight stitches wide--in about 90 minutes yesterday morning. Seriously. I timed it because I was able to use a ball of yarn per TV show while I was watching the Food Network "cooking school" shows. Three balls makes a scarf, and they retail for $12.80 ($11.52 from us, of course). For under $35US and under two hours of knitting, you have a fab gift or a new accessory. My kinda project! We've got plenty of everything you see above, so if you're interested, you know the drill. In the mean time, I'm going back to packing boxes and plotting blog entries (we have soooooooo much amazing new yarn--wait until you see the next few posts). Have a great Sunday and go knit something!